One of the big names this week, an enduring band who helped define the era. The story of Simple Minds is one of evolution: from sound to sound, period to period, rise, decline, moment to memory. Now more than thirty years into their run, the group has undergone numerous changes and reinventions but have always been best known for their work in the eighties. On that topic, the story of Simple Minds is also, as was the case with several other groups of the era, one of a definitive song and lingering assumptions of one-hit-wonderdom, at least in North America. Emerging out of the late seventies climate in Glasgow, the chief members of Simple Minds, Charlie Burchill and Jim Kerr, got started in a punk outfit called Johnny and the Self-Abusers, before leaving to form their own group. The initial Simple Minds were a rock band after punk, which their first record, 1979’s Life in a Day, displays. While not a particularly interesting record, it nonetheless stands as a first effort; one that the band would quickly distance themselves from, however, when they recorded and released Real to Real Cacophony later the same year. This second album caught onto some of the burgeoning experimentalism of its time and, although a bit jumbled, it marks the point where Simple Minds began defining their own style, a journey that intensified through their next couple of releases and resulted in some interesting work. The following year the band’s third LP, Empires and Dance, came out and evidenced further experimenting with its embracing of the emerging electronic pop trend. Collected together, these first three records represent the early facet of Simple Minds, who would be nearly unrecognisable as the same band in a few years. It should be noted how prolific Simple Minds were during the early eighties. They were putting out a record a year, doing plenty of touring and appearances, and all the while searching for their style. Their early catalogue is therefore a bit uneven, but it has a remarkable momentum behind it. After a label change, they released Sons and Fascination and Sister Feelings Call (a shorter companion record) together in 1981, and found their first international success. When viewed as the culmination of their early work, these records stand out as the best thing they had done up to that point, and when viewed as the beginning of a new period for the band, they point the way to what was to come. The songs strike a balance between experimentalism and melody as they’d never done before, and a new direction in sound was ushered in, as original drummer Brian McGee left after the recording and replacement drummers came in, with Mel Gaynor eventually settling in full-time during the sessions for the superb New Gold Dream (81-82-83-84) in 1982. 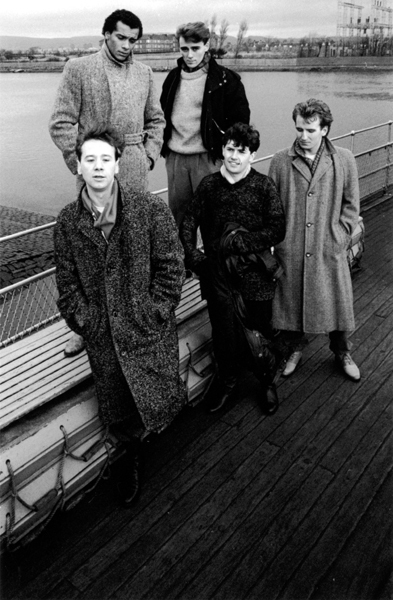 Leaving the experimenting of their early records mostly behind them by ’82/’83, Simple Minds were standing astride the new romantic and big music currents (see edition #8 for more), gaining popularity with their two breakthrough records New Gold Dream and 1984’s Sparkle in the Rain. Anthemic rock had been creeping steadily to the fore of the band’s sound, and the weirder textures and lyrics of the early records had given way to an aesthetic based on big melodies and Christian-tinged imagery. This was the beginning of the band’s most successful period, as this new sound would carry them to the top of the charts all around the world. The singles from Sparkle in the Rain were their most successful up to that point, but in 1985 the band were offered a song to be included in the John Hughes film The Breakfast Club. Everyone knows what came of that, but what hasn’t always been as commonly known is that Simple Minds didn’t write “Don’t You (Forget About Me),” nor did they like it, particularly. It was written by film composer/soundtrack director Keith Forsey, and Simple Minds were not his first choice of performers for it. They eventually recorded the song though, and paired with the success of the movie, it quickly became huge. It was, however, someone else’s song, and the band were always clear about their feelings toward that, as it never appeared on any of their studio albums (only greatest hits and live collections, eventually). That song has gone on to become a bit of cultural iconography, though, and it got the band exposure on a level they would never have had otherwise. The downside was that (as is par for the course with that level of fame) they would never have that kind of success again and, furthermore, when you do something that iconic, it follows you forever. Riding the popularity from The Breakfast Club, the band released their next, and most popular album, Once Upon a Time, later in 1985. The record, featuring co-vocalist Robin Clark, had a couple of big singles through ’85 and ’86, and led the band to audiences all around the world, but original bassist Derek Forbes, who had always provided an essential element of the band’s sound, left before it was recorded. Their sound had, by this point, become stadium rock eighties-style, and this highest point of their success was documented on 1987’s double live LP Live in the City of Light, which also evidenced the next changes for the band, as their increasing engagement with political matters would come to define their work at the end of the eighties. And this point is where we’ll leave it, as there’s much more of the band’s career to cover, but what follows in the nineties and 2000s is of little pertinence to the aims of the column. By the late eighties Simple Minds were one of the biggest rock bands on the planet, but musically they’d become increasingly normalised, eventually coming to embody many of the trappings of mainstream rock of the time, and when the alternative era rolled around they had unfortunately lost most of what relevance they’d had. Since the departure of original keyboardist Mick MacNeil at the end of the eighties, the band has basically consisted of Kerr and Burchill plus a rotating cast of players (including original members, occasionally), who have continued releasing records and touring over the years, but have never fully got out of the shadow of their work in the ’80s, never quite equaling it again, either.